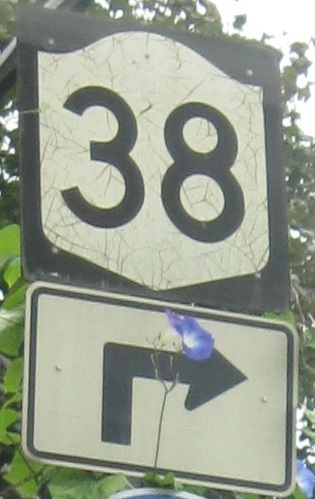 Nothing too remarkable about this reference marker except it's not on any route anymore. 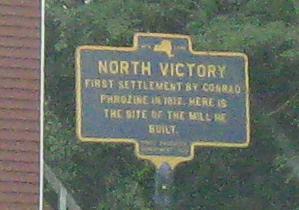 It was found on old NY 283, which was cut off by NY 17. With the death of that part of 283 came the death of the NY 38 duplex. 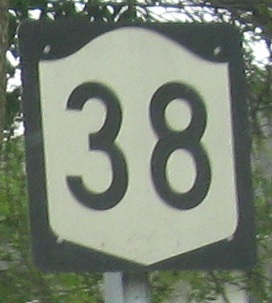 Around the circle at the beginning of the shortest signed route in New York, which ends right away at NY 38A. 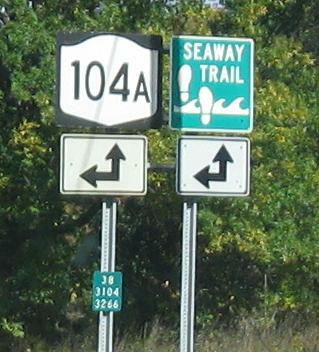 Its only function is to complete the state route loop around Owasco Lake. 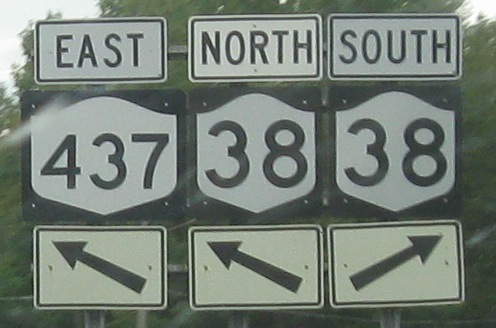 It would be much better served by swapping with NY 38A north of this point, allowing 38A to end at 38 and giving some length to 437. And I would be better served by bringing back the shields that went with these arrows. 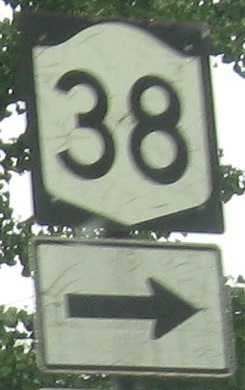 NY 38 SB leaves NY 34 in Auburn by following Swift St. to Lake Ave., where it turns right. 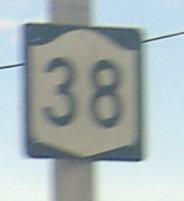 Swift St. WB, NY 38 NB. 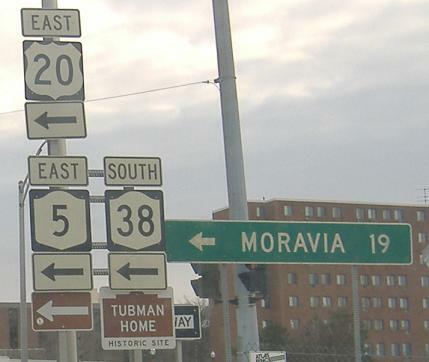 Lincoln St. WB, what one might take to avoid the short NY 38 run along the Arterial (US 20/NY 5) if there were a compelling reason. The assembly is in need of a "TO." Auburn multiplex photos. 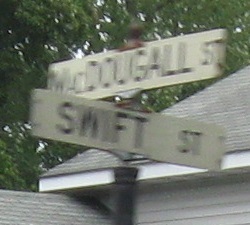 The first is on William St. SB at Lincoln St., and has a closeup that I've put only on the NY 34 page to make you visit it. 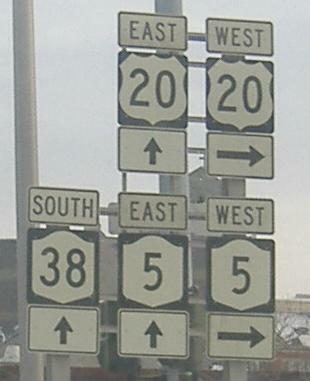 SB at the other end of the US 20/NY 5 multiplex in Auburn. 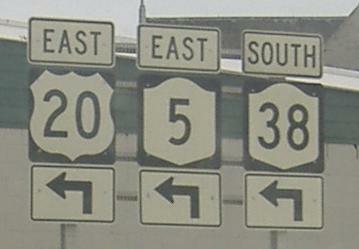 I would have put those photos here, but of the three routes, the only one that has no claim to being the through route is 38. 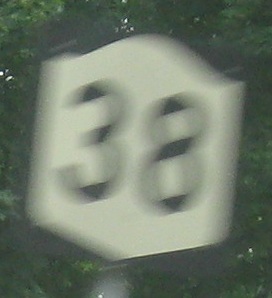 NB from NY 104 to the end of NY 38.